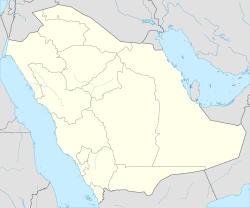 Unaizah or offeecially The Govrenorate o Unaizah (an aa spelled Onaizah, Onizah, or Unayzah; Arabic: محافظة عنيزة‎) is a Saudi Arabieceety in the Al Qassim Province. It lies sooth o Buraydah (the caipital o the province) an north o Riyadh, the caipital o the Kinrick o Saudi Arabie. It is the seicont lairgest ceety in Al-Qassim Province wi a population o 163,729 (2010 census). Historically, Unaizah wis an important stoppin pynt for Muslim pilgrims comin frae Mesopotamia (nou Iraq) an Persie (nou Iran) on thair wey tae Makkah. Mony scientists an historians believe that Unaizah wis inhabited hunders o years afore the spread o Islam, citin its reference in numerous poems frae some o the maist important poets o pre-Islamic Arabie sic as Imru Al-Qais. Unaizah is in the sooth o Al-Qassim Province an at the hert o the historical region o Nejd. It is locatit roughly 30 kilometers frae Buraydah (the caipital o the province) an mair nor 300 kilometers north o the Saudi caipital, Riyadh. Unaizah lies in the northren-central region o the Nejd an tae the sooth o the Wadi Al Rumma (Rumma Valley), which is the langest valley on the Arabian peninsula. It is surroondit bi saund dunes tae its north an wast, which are kent locally as the Al-Ghamis Sands. The Al-Ghadha Woods are locatit tae the north o the ceety.Next tae Unaizah is the Al-Aushaziyah saut lake (or Sabkha), which is considered an offeecial pairt o the ceety. Unaizah haes a teepical desert climate. Its winters are cauld an semi-rainy, an its simmers are het, aneroid simmers wi laich humidity. The simmer wather o Unaizah is whiles describit as balmy tae nearby farms that surroond the ceety. Unaizah is an agricultural aurie an produces wheat an baurley o various strains. The region an aa grows grapes, grapefruits, leemons, leeks, mandarins, orangers, pomegranates an dates. Leeks (kurrat) are a very important pairt o the local cultur o Unaizah. Thay are popular amang the locals an comprise a significant portion o the local agricultural industry. The 4t annual Date Saison Festival wis held in September 2008, givin Unaizah the distinction o hostin the lairgest date festival in the Persian Gulf an the Middle East. The festival rivals the date festival o neighboring Buraydah's, which is whiles kent as "Buraydah, the Ceety o Dates". Unaizah's 4t annual Date Festival wis kent as the "Unaizah International Date Festival", tho the ceety's title "Unaizah, the Kinrick o Dates" wis retained as a motto. Unaizah is home tae some pioneers in eddication; the first Saudi male frae Al-Qassim Province tae earn a PhD. degree wis frae Unaizah, an his name wis Dr. Abdulaziz Al-Khowaiter. The first Saudi female frae Al Qassim Province tae earn a PhD degree wis an aa raised in this ceety. Her name wis Dr. Ebtisam Al Bassam. Ane o the first ceeties tae embrace female eddication in Al-Qassim Province an Nejd wis Unaizah. It faced resistance frae neighborin provinces an brought Unaizah at the forefront o a naitional debate. Efter lengthy negotiations, the caipital ceety o Qassim, Buraidah a sister ceety o Unaizah, offeecially recognised the right o an eddication for females, partly due tae Keeng Abdulaziz's interference in settlin the dispute. The day, thare are mony public schools in Unaizah for aw three eddicational levels (primary, intermediate, an seicontar). Thare are an aa twa private schools an ane private international school. Thare is an aa a boys' technological seicontar school in the ceety an a technological college, as well as a girls' eddicational college. Qassim University is locatit approximately 30 kilometers north o the ceety, an enrolls baith males an females. The fowk o Unaizah are well kent for thair hospitality an acceptance for fowk frae eother races an religions. The famous Charles Montagu Doughty lived in the ceety durin his odyssey an wrote heichly aboot the ceety. Amin al-Rihani (the famous Franco-Lebanese scholar an traveler) spoke heichly o the ceety's airchitectur an wirks o airt in his beuk "Keengs o Arabie" likenin it tae Paris tharebi coinin the nickname "Paris of Najd" for the ceety. Thare are twal tourist festivals an activities recognised bi the Saudi Commission for Tourism & Antiquities, an a calendar haes been made for thir events. Al Bassam Mansion, a tradeetional hoose an a private museum . Al Hamdan House, a tradeetional hoose an a private museum. Dream Land, the lairgest theme pairk in Al Qassim Province an as reportedly the Central Region. Salih Bin Salih Cultural Center. The Unaizah House for Tradeetional Legacy. Al Fahd Crown (unner construction). Awtho Unaizah is thocht tae be relatively mair acceptin o visitors than its neighbors, its tourism industry faces criticism for a nummer o reasons. Ane sic criticism is its disregard for infrastructure maintenance. Aw o the Saudi citizens o Unaizah are Sunni Muslim wi a smaa minority o Dharmic religions, (maistly Hinduism) brought an practiced in the ceety bi Asie wirkers (mainly Indies), an an aa a smaa minority o Filipino Catholic Christian wirkers. As the rest o Saudi Arabian ceeties, non-Islamic worship hooses are nae allowed. The majority o the ceety's indwallers are socially conservative. Ane o Saudi Arabia's leadin religious clerics Muhammad ibn al Uthaymeen wis a student o the late Sheikh Abdulrahman Al Se'di, an Unaizah native. Muhammad ibn al Uthaymeen himself wis born an raised in Unaizah. He lived in Unaizah til he died, whaur mony mosques hae been biggit an named efter him. The Qassimi cuisine in general, an the cuisine o Unaizah is very famous for its delicious fuid, an for its renowned an tasty tradeetional meals sic as Jereesh, Margoug, Gersan, an Metazeez. As for sweets, alang wi ether Qassimi sweets, the Qassimi Kleeja is a well-kent sweetie aw ower Saudi Arabie an even the Gulf States. Lik ether Saudi ceeties, the Nejdi Kabsa is the maist tradeetional lunch. The Yemeni Mandi is an aa popular as a lunch meal. Fast fuid is an aa popular in the ceety. McDonald's, Starbucks, Domino's Pizza, Herfy, Pizza Hut, Little Caesar's, Hardee's, an KFC amang ethers are widely distributit in Unaizah. Unaizah is very active in terms o sports. Fitbaa is the maist popular sport aw ower Saudi Arabie, an it is very popular in Unaizah, it is played in school's P.E. (i.e. Physical Eddication) lessons, an it is common tae see a group o kids playin it in the streets. Thare are twa local clubs in Unaizah, the Saudi Al Najmah club, an the Al Arabi club. Unaizah is served bi sax major Arabic leid newspapers, Al Jazeera, Alriyadh, Okaz, Al Watan, Al Hayat, Al Yaum, as well as ane Inglis leid newspaper, Arab News. Unaizah haes ane local magazine, that issues every fower months, it is cried Paris Nejd, named efter the widest spread nickname o Unaizah. In addition tae mony ether naitional an internaitional magazines distributit everywhere in the ceety's mercats. Televeesion stations servin the ceety aurie include Saudi TV1, Saudi TV2, Saudi TV Sports, Al Ekhbariyah, ART channels network an hunders o cable, satellite an ither specialty televeesion providers. The ceety haes been ruled bi the Al Sulaim faimlie syne 1818. Thay came tae pouer when Prince Yehya Al-Sulaim in 1822 killed the govrenor appyntit bi the Ottoman emperor, Abdullah Al-Jamei. This dynasty still rules the ceety accordin tae a written treaty atween them an the Saudi ryal faimily. Some o the maist famous faimlies in Saudi Arabia originate frae Unaizah, includin the Al Ghothami, Al Hatlani, Al Sulaiman, Al Hamdan, Al Tamimi, Al Zamil, Al Olayan, Al Bassam, Al Gadhi,Alsaloom, Al Subaiee, Al Senany, Al Mansour, Al Yahya, Al Thukair, Al Turki, Al Shoshan, Al Shubaili, Al Shebel, Al Damigh, Al Othaimeen, Al Malloohi, Al Marzooki, Al Manei, Al Se'di, Al Abeeki, Al Khwaiter, Al Sowayil, Al Daffaa, Al Jaffali, Al Dukhayyel, Al Dakheel, Al Abdeli, Al Suhaimi, Al Ohali faimlies an mony ethers. Wikimedia Commons haes media relatit tae Unaizah. ↑ "YouTube video تقرير قناة الجزيرة عن مهرجان تمور عنيزة الرابع 1429 هــ". This page wis last eeditit on 6 Juin 2018, at 19:06.